73101 is an electro diesel loco, which is to say that it can collect its power from the third rail when that is available but it also has as diesel engine to provide limited power when away from the third rail - 600bhp instead of 1,600. This type was used on some services to Bournemouth, some instead of the normal electric units and also on the Channel Island boat trains. 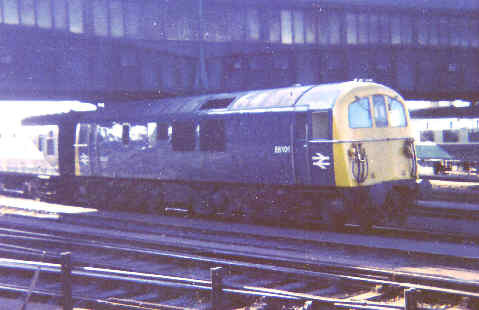 The second type of electro diesel was the Class 74, such as E6101 (later 74001) seen here at Clapham Junction. 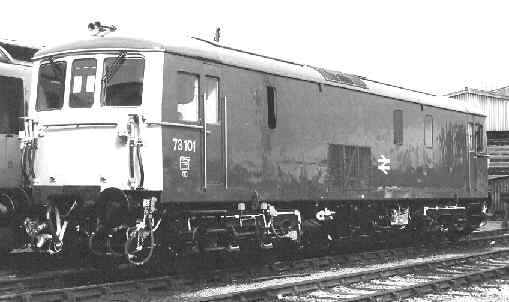 This more powerful class was converted from "straight" electrics of Class 71 for working the Channel Island boat trains and those to Southampton's Ocean Liner Terminal. However by the time they were introduced the heyday of the ocean liner had past and there was little work for them, this combined with reliability problems led to their early demise, the 73's being capable of handling the remaining traffic.